My Civil War Obsession: Picket Guards: an explanation from the "Youth's Companion"
Picket Guards: an explanation from the "Youth's Companion"
I have a bound (well, mostly, as age has taken a toll) collection of quite a few issues of a newspaper called The Youth's Companion that was published in Boston. A sales solicitation I found on one of the issues (October 6, 1864), describes it as: "A Family Paper, devoted to Piety, Morality, Brotherly Love ----No Sectarianism. No Controversy. Published Weekly By Olmstead & Co., Boston, Mass., No. 22 School Street. Price $1.00 1 year, payment in advance." Here is a link to more background information on this publication. More information can be found here as well. Since the ones in this collection were from the Civil War era, I thought it might include some interesting stories about the war and different parts of it, and, after flipping through it, I found my belief proven to be correct. The story published here comes from the January 15, 1863 edition and provides a description of pickets and their job duties. (This description apparently appeared in a journal called the Christian Herald before the Youth's Companion reprinted it.) I found it to be a fine explanation and despite apparently being written towards people without much military background, I thought the clarity of the description to be worth sharing. More entries of war-related articles from this paper will follow in the future. I have found several that tell interesting tales, some of subjects known to all Civil War students and others of more common people and day-to-day events that only could take place during the Civil War. You read in the papers about "picket firing," about capturing pickets, about "driving in" pickets, and so on. Perhaps you would like to know what the pickets of an army are. They are its sentinels, its watchmen, its lookouts, to give it early notice of danger. When an army encamps, the soldiers are tired, and want to sleep. But if they should all lie down and go to sleep, an enemy might come and surprise and capture them. Hence some are "detailed" from every company, and placed in charge of an officer, called the "officer of the guard." He takes them out from a quarter to half a mile and places them where they can watch for the enemy without being seen. He is careful, also, to place them where they can readily run together and help each other if there is danger, or can send an alarm back, from one to another, to the officer, or into camp. This is called putting the guards in supporting distance. When the picket is posted by the officer, he is told to keep a constant lookout in every direction, and to listen for all unusual sounds. If a single man approaches, he is to challenge him, and if he cannot give the countersign, the picket is to call for the officer of the guard, and to keep the man at the point of his bayonet until the officer comes. If the man, when challenged, tries to run away, the picket is to shoot him, for he is probably a spy. 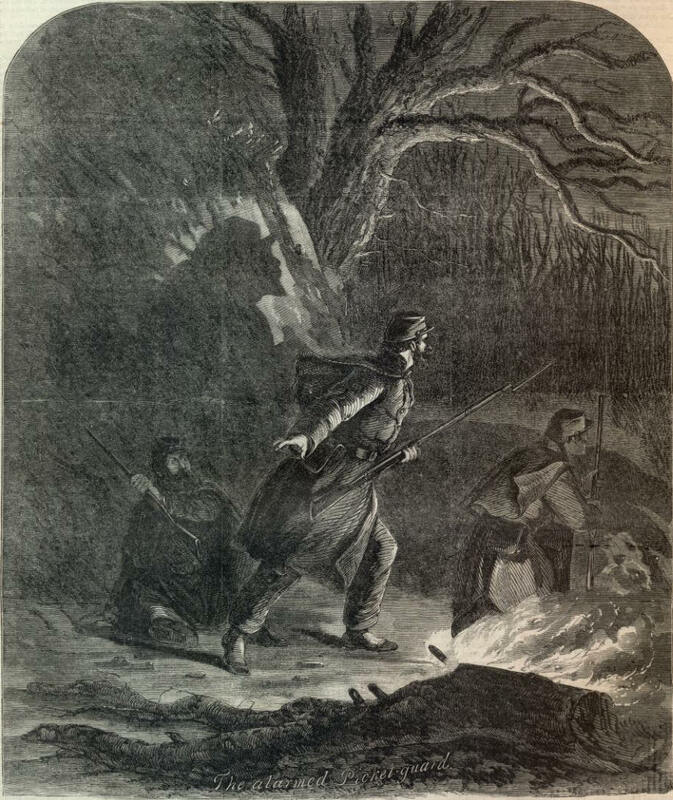 If the picket sees or hears a large body of men approaching, he does not wait to challenge them, but fires his gun to give the alarm, and runs back. The other pickets, hearing the alarm, fall back too, and form together under the officer of the guard. If the body of men coming seems to be more numerous than they, the guards fall back to the camp, and rouse the whole army to resist an attack. This is called driving in the pickets.